Tynecastle 16s continued their winning ways after the Christmas break as they edged out Longniddry Villa 16s 1-0 at Saughton to go top of Division 1. Tynie looked comfortable in the early stages of the contest as they put considerable pressure on their opponents. In the final third of the field, however, Villa remained stubborn and kept their opponents at bay. Eventually, though, Tynie’s persistence paid off and they had the breakthrough. John Robertson turned his marker on the edge of the Villa box and slammed a left-footed strike into the bottom-right corner. Tynie almost gave Villa an avenue back into the game just before half-time as Calum Page was adjudged to have handled in the box. But the penalty by Villa’s Jay Hampshire was well saved by keeper Kyle Wilson. Into the second half, Tynie were adamant they had gone 2-0 up. Sean Ward’s precision cross from the left was headed by Robertson on to the underside of the bar with the Tynie staff and subs appealing it bounced down over the line. But the referee deemed no goal. 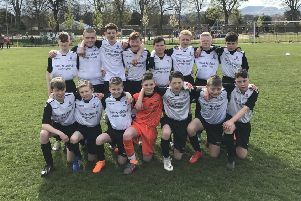 Craigroyston 14s kept themselves in the hunt for Division 4 silverware as they comfortably defeated Newtongrange Star 7-2 at Craigie Park. The game began fairly evenly with both Craigie and Star getting on the scoresheet. Dean Forbes stabbed in from a corner to give Craigie the lead before Star equalised soon after thanks to Kieran Aitken-Craig’s composed finish through on goal. But once Craigie got on top in the match they never looked back. Tucker Smith volleyed Craigie back ahead and goals from Brad Gilchrist and Forbes once more meant the hosts went in with a 4-1 lead at the interval. Jack Croaly made things even more comfortable early on in the second half for Craigie as he smashed the ball high into the Star goal from the right hand side of the box. Briefly, Star fought back with a goal through Lee Duncanson but Craigie saw the game out with two more goals of their own. Forbes bagged his hat-trick and Smith glanced a header in to make it 7-2. The win puts Craigie just two points behind leaders Blackhall, in third place, with a mighty four games in hand. Portobello CFA 13s started 2017 with a victory as they swept aside Longniddry Villa 13s 3-0 at Bingham Park. Portobello worked hard in the first half of the Division 1A contest as they dominated possession and opportunities in front of goal. But somehow Longniddry hung on to go in on level terms at the interval. The hosts may well have been ahead but, early on in the second half, they were less wasteful in front of goal. Cameron Mason rounded off an impressive, patient team move as he picked out the goal from close range. It settled Portobello and they built on the lead soon after to go 2-0 up. David Graham took aim from distance with a free-kick and the ball flew over the Longniddry wall and high into the net. As the half wore on it was clear there was only going to be one winner. It was one-way traffic and Portobello didn’t let up going into the final 20 minutes. Captain Sean Rissi helped gift his side a third with an incisive pass that Aidan Miller finished with a left-footed drive. Longniddry huffed and puffed but they couldn’t quite do enough to grab a consolation. Portobello may well have had a fourth but before they could find the net again the referee called time on the game.